Though Russians are building all of their 2018 World Cup stadiums from scratch (even if Luzhniki stayed within the old shell), only two of them utilise the recently-popular tensile cable structure. We've seen one of them being put in place in December (Yekaterinburg), now it's time for Volgograd. 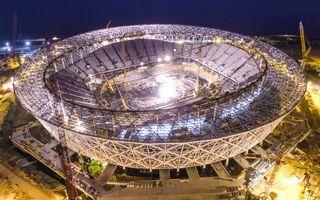 Our full locked coil structural ropes for the roof construction of the new Volgograd Stadium (diameter: 130mm) are prepared for the "big lift"
At Volgograd Arena the roof will be supported by a large steel compression ring and two tension inner rings. Altogether this means 88 individual cables, each 130mm thick. 42 of the cables will be lifted to the full stadium height of over 40 meters, the remaining 42 will be placed well beneath the roof's glass/membrane cladding. The roof remains the single largest portion of the stadium yet to be delivered. With just over 150 days to go, Volgograd Arena is largely ready, at least structurally. The concrete structure is complete, so is the facade and external portions of the roof (covering the promenade around all stands). Major remaining works are installations, including over 11,000 m2 of stained glass and 8,000 m2 of composite panels. Should all elements be delivered in time, Volgograd Arena will be ready for delivery on November 26.